Mizuho OSI®, a leading manufacturer of specialty surgical tables, is demonstrating its suite of advanced surgical tables and integrated technology for the operating room for trauma and orthopedic surgeons at the 19th EFORT Congress in Barcelona, Spain, from May 30th to June 1st, 2018. Featured products in booth #C2 include the Trios® Surgical Table System, Paramon® OR Integration System, Hana SSXT® Specialty Surgery Extension, and the Hana® Orthopedic Table. The Company is hosting a symposium presentation on optimizing the anterior approach for hip replacement. As surgeons seek to reduce patients’ recovery time, advanced surgical techniques, including the anterior approach hip replacement, are gaining in popularity. In the symposium session, Optimizing the Anterior Approach with a Proven Algorithm, taking place on May 30th at 13:00 CET, orthopedic leaders bring a global perspective on the anterior approach and how the Hana® Table is a valuable tool in the success of this procedure. Mizuho OSI® is a U.S. based company and the leader in the markets for specialty surgery and patient positioning. The company’s portfolio includes specialty surgical tables for procedure-specific approaches that improves patient outcomes in spine and orthopedic surgeries, a range of general surgical tables, and consumable surgical patient care products. Mizuho OSI products are sold direct in the U.S. and Germany, and by the Mizuho Corporation in Japan. Both companies sell their products and solutions worldwide through authorized international distributors. Mizuho OSI is a wholly owned subsidiary of Mizuho Corporation located in Tokyo, Japan, a leading surgical table manufacturer in Asia. The Mizuho Group also includes TRILUX Medical®, a subsidiary of Mizuho OSI. TRILUX Medical is a provider and manufacturer of surgical lights, surgical pendants, operating room patient integration, and video management systems. TRILUX Medical products and solutions are sold direct in Germany and worldwide through authorized international distributors. More information is available at www.mizuhosi.com and follow us on Twitter, Facebook, and LinkedIn. Mizuho OSI®, a leading manufacturer of specialty surgical tables, pressure management solutions, and table-specific patient care kits, has unveiled a suite of mobile applications to assist customers through the set-up of their specialty surgical equipment. These apps show surgical teams how to reconfigure the tables for various procedures, making it easy to know the right arrangement for each procedure and allowing for a personalized surgical experience. Ensuring surgical tables are installed correctly allows the hospital to use equipment to its fullest for the benefit of their patients. Just minutes in the operating room can make a significant difference in the care of the patient, beginning as early as room setup.1 As many surgical teams are familiar with traditional flat tables, upgrading to a customizable table leads to a change in workflow that ultimately benefits the entire surgical process. When surgical teams are guided through the setup process, they are able to spend less time preparing for a procedure, allowing them to treat patients more efficiently. Believing this efficiency is central to clinical satisfaction and patient outcomes, Mizuho OSI is committed to improving the education of clinical teams through its latest setup guides. The Company offers this support to customers at no additional charge, greatly improving the ease of use of its solutions. Each guide includes visual references, standard component installation instructions, table features, procedure setup instructions, storage and components, and optional accessories for the device. Together with its full portfolio of surgical solutions, Mizuho OSI is supporting care teams through continued innovation in the OR. The mobile applications are available to Apple and Android users, with web-based setup guides available on Mizuho OSI’s website. UNION CITY, Calif., Feb. 20, 2018 /PRNewswire/ — Mizuho OSI®, a leading manufacturer of specialty surgical tables, pressure management solutions, and table-specific patient care kits, today announced it will be attending the first Annual Arthroplasty Conference, Hyderabad (AACH) at the Hyderabad International Convention Center in India from February 24-25, 2018. Using the Mizuho OSI Hana® Orthopedic Surgery Table, Dr. Andrew Wickline will be conducting a total hip replacement applying the anterior approach at KIMS Hospital Secunderabad, which will be broadcast live to attendees of the conference on February 24 at 9:00 a.m. IST. Dr. Wickline is an orthopedic surgeon in Upstate New York and is the state’s volume leader in joint replacement. Working with Dr. Uday Krishna Myneni at KIMS Hospital, he seeks to showcase the benefits of the anterior approach and how technology like the Hana Table can optimize this surgical technique through the broadcast. Anterior Hip Replacement allows the surgeon to reach the hip joint from the front of the hip, leaving muscles attached to the pelvis and femur undisturbed. This method of hip replacement minimizes pain and the time from surgery to recovery for the patient. As techniques and technologies around arthroplasty have evolved in recent years, the AACH is the first international conference devoted to connecting aspiring and practicing arthroplasty surgeons with masters in arthroplasty from across the world. The conference includes panel discussions, case studies, technique videos, and live surgical demonstrations alongside free paper sessions that allow upcoming arthroplasty surgeons to showcase their work on an international platform. 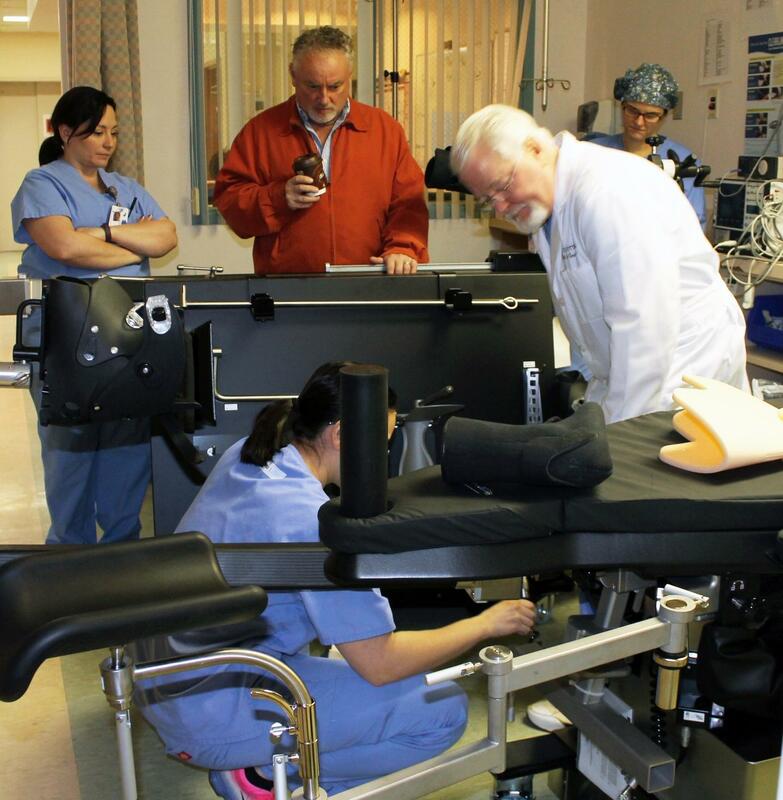 WELLSVILLE — Increased patient safety and comfort are just two of the benefits of the new orthopaedic surgery table, recently delivered and put into immediate use at Jones Memorial Hospital, the hospital said Tuesday. Purchased through a gift from Charlie Joyce and Otis Eastern, the new fracture table was chosen with input from Dr. Paul Axtell, orthopaedic surgeon. The new fracture table, a Mizuho OSI Hana table, replaces one that is more than 30 years old. LOUISVILLE, Ky. (WHAS11) – This year in the United States more than 300,000 people will get an artificial hip, and now one Louisville doctor gets his patients in and out of surgery and home again in just one day. Read full article. Karen Klarman-Williams had such bad osteoarthritis in her right hip that she could barely sleep. “Everything was painful. It interfered with my sleep. I couldn’t walk. Putting my shoes on was a problem, getting in and out of the car was a problem. Getting up and down stairs was a challenge.” Read full article. Ventura County Star ~ Hip Surgery: Newer Techniques Reduce Pain and Speed Recovery. Last year orthopedic surgeons performed more than 330,000 hip replacements in the United States, most frequently on older adults who had “wear-and-tear” osteoarthritis or who had fallen. They’re also seeing more young patients with conditions such as rheumatoid arthritis, injuries or tumors that require surgical intervention. Read full article. A Coquille Valley Hospital physician uses advanced orthopedic surgical techniques and now has a table that can accentuate those skills. Read full Article. Hip replacement surgery can be a scary thing but at the University of Tennessee Medical Center, it’s no big deal because of a revolutionary type of surgery. It’s called Anterior Approach Hip Replacement surgery, and you can be up and walking the very next day. Read full article. When your bad hip – from a medical condition or trauma – is working against you to the point of constant pain and disability, and you’ve exhausted all other treatment methods, hip replacement may be on your radar. But where do you begin to look for the right surgeon and the best approach for surgery? Read full article.